The first impression after seeing the cover of this album is: creative dark drones. The first tones say: black metal. Which in my opinion sums up what post/sludge metal is about: a creative, more innovative and darker twist to the black metal genre. Amniac is exactly this. After the first screams they create space for more melody and dragging symphonies. Because where black metal has an aggressive tone, post/sludge has more depression then aggression as a basic mood. And depression seems to invokes more than just apathy. Amniac takes the listener to a vast landscape of feelings, sometimes overwhelming, sometimes contemplative and lots in between. The second release of this Greek band is a concept album, mostly based on the oppression of patriarchy and the role of women in society and witchcraft. Opening song, The Coven starts fairly brutal, but quickly introduces a clean counter voice next to the grunts and screams, which works refreshing. The changing rhythms and some power chords make it into a god start. 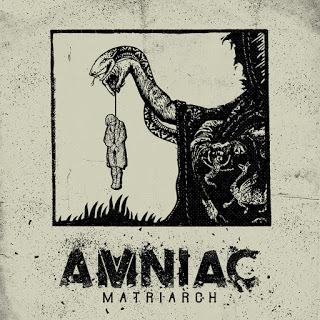 Matriarch has a more melodic, softer start, building up guitar structures that make it into an attractive song to listen to more often, in order to fully take it in. In Huntress Virgin Goddess pushing chords and driving vocals have an addictive effect. What an amazing power! After 3 minutes the song takes a turn with more diversity, but also with hypnotic repetition. Being the heart of the album, it is also really the heartbeat of it. Devadasi sees the return of the two vocal styles mixed to one song, together with different use of instruments it sounds like a creative genre mash-up. Erebos is the final song in this 40 minute journey in the dark reality of Amniac. This song has in its 9 minutes the most cohesion on the album. Not the darkness of other songs, an attractive build-up, nice instrumental balance. In post-black that can be a weakness, but it is quite good actually. Where my first impression of the album was: ‘nice but average post-black’, after listening to the album a few times, it triggers much more. Thanks to the changes in styles the album creates depth and gets hold of you just when you are about to perish in misery.